Shadows form with sharp edges when they are cast on a nearby object, but the outlines become less distinct the farther away they are cast. This can easily be explained because light travels in straight rays and every light source has a certain size. The ray paths show that a region exists at the edge of the shadow that is partially illuminated; this region, and penumbra, makes the outlines of the shadow fuzzy. 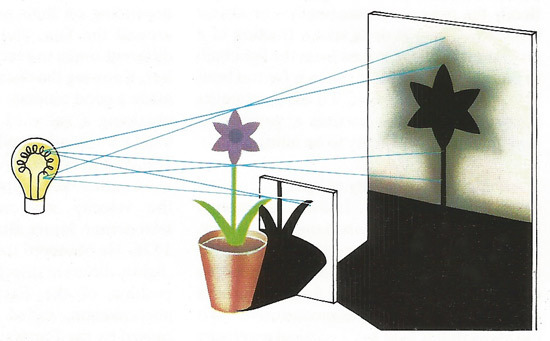 The dark part of the shadow, the umbra, is completely shielded from the light source. The penumbra is less broad the closer the shadow is to the object casting it, and so nearby shadows look sharper. A shadow is a nonilluminated region, shielded from receiving radiation from a light source by an extended object. It varies in size depending on the distance between the light source and the screening object. A point source gives a sharply defined shadow, but an extended source gives rise to a region of full shadow (the umbra), surrounded by one of partial shadow (the penumbra).